Zaius allows you to create as many custom fields as needed in order to store data on your Events, Products, Orders, and Customers objects. 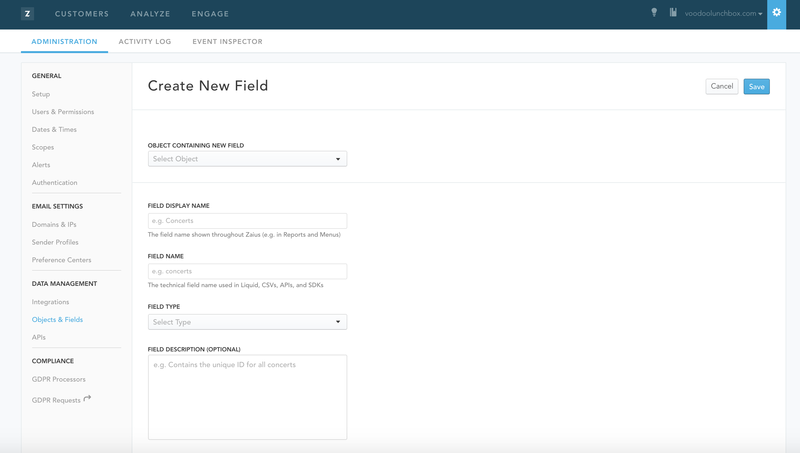 Before loading data into Zaius, you will want to ensure that any custom fields are created as necessary to capture data from your systems to store all of your data in Zaius. To create a new field, you will first want to select the object containing the new custom field from the first dropdown. Field Display Name: The field display name is what is shown throughout Zaius. Field Name: The field name is the technical field name used in Liquid in campaigns, CSVs, APIs, and SDKs. Field Description: This is optional, but feel free to enter in details around what type of data this field is storing, the source of the data, etc to provide notes. Once you have customized all aspects of your custom field, select Save in the upper right hand corner to save your field.